(Chuck Zlotnick | courtesy Marvel Studios) Brie Larson stars in the superhero origin story "Captain Marvel." How powerful is Captain Marvel? 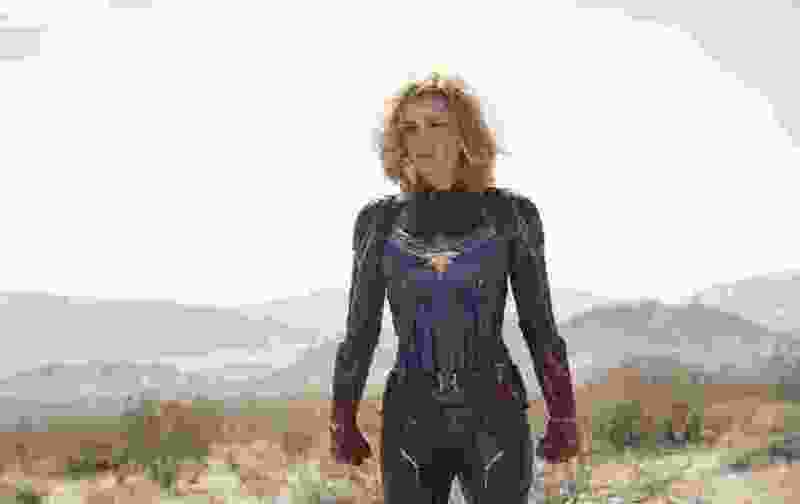 She made the internet’s foulest minds explode, and prompted a major website to alter a longstanding policy — and that was before people saw the movie “Captain Marvel,” easily one of the most fun, exciting and important chapters in the Marvel Cinematic Universe. There are fanboys itching to attack me for that last sentence. They’ll say I’m getting paid off by the Disney/Marvel oligarchy. Or they’ll say I’m “virtue signaling,” a repellent insult hurled at liberals by the far right, a shorthand way to call someone a liar and a poser who doesn’t believe in the equality or fairness they espouse. Fanboys have targeted “Captain Marvel” for phony outrage because of its star, Brie Larson. She noticed that the majority of reporters and critics she reads are white men — and wondered aloud if wouldn’t it be nice if the press corps was more diversified? In a speech last summer urging film festivals to give credentials to a wider pool of writers, Larson said, “Am I saying I hate white dudes? No, I’m not.” Some white dudes — the sort who complained when women were cast as the leads of the “Ghostbusters” reboot, the “Star Wars” franchise and “Doctor Who” — decided that Larson definitely does hate them. They jumped onto the review site Rotten Tomatoes to post negative reviews, aiming to drive down a film’s audience score before any public screenings. This time, though, Rotten Tomatoes disabled that feature, ruling the site would only allow audience reviews once the movie opened. The trolls complained more, and said they would boycott “Captain Marvel” — even though the movie’s advance sales were breaking records back in January. Some boycotters say they’ll go see the James Cameron-produced “Alita: Battle Angel” this weekend instead — as if pitting one female action hero against another isn’t its own form of sexism. Eventually, the haters will be drowned out by the fans who, I’m convinced, will embrace “Captain Marvel” as a fast-paced, sometimes funny, always smart action movie with a heart of gold. It’s a period piece, as the World War II adventure “Captain America: The First Avenger” was, but this time set in 1995. The story starts on the planet Hala, home world of the Kree, literal blue-bloods of the galaxy, whose Starforce keeps order as they battle the shape-shifting Skrulls that aim to infiltrate planet after planet. The newest Starforce member is Vers (pronounced “Veers”), Larson’s character. She’s been taught by her commander, Yon-Rogg (Jude Law), to fight smart and without emotion. Those emotions flare up when Vers sees flashes of her past, which she can’t remember. After some hostility at first, Vers and Fury team up to figure out what the Skrulls want on Earth. Larson and Jackson form an enjoyably salty buddy-cop pair, and much of the movie’s humor comes out of their sharp banter, while also filling in some of Fury’s well-cultivated mystery. The heart comes as Vers begins to piece together her past. As she learns more about Earth, a missing scientist (Annette Bening), and a U.S. Air Force pilot named Carol Danvers, she also begins to question what she thinks she knows about the universe. The directing team of Anna Boden and Ryan Fleck, known for such Sundance hits as “Half Nelson” and “Mississippi Grind,” bring a pleasantly offbeat sensibility to the big-budget action heroics. This is evident in the script, co-written with Geneva Robertson-Dworet (“Tomb Raider”), which builds up the action-adventure stakes while also focusing in on Vers’ struggle to understand herself. This could be heavy stuff, like much of “Avengers: Infinity War” was, but Boden and Fleck have a light touch that plays up the comedy and absurdity of having a superhero walking around Los Angeles. They also have a solid supporting cast — including Gemma Chan and Djimon Hounsou among the Starforce crew, Ben Mendelsohn (“Rogue One”) as the lead Skrull, and Lashana Lynch as an Air Force pilot with a major tie to Carol — and an ear for smart ‘90s soundtrack picks. Boden and Fleck also handle the pyrotechnics with abundant skill. There’s a fight scene near the end, set in outer space, that is reminiscent of Christopher Reeve’s heroics in “Superman,” only bigger and faster — but at no time do the filmmakers lose Larson’s humanity and ferocity amid the spectacle. “Captain Marvel” is an origin story on par with “Black Panther” and “Captain America: The First Avenger.” It’s always tricky introducing a new character, especially the most powerful one in the Marvel Comics roster — and Boden and Fleck, and Larson, do it with high energy, good humor and intelligence. After conquering the trolls and taming the internet, she’ll have no trouble winning over the world. Marvel Comics’ most powerful hero gets an origin story worthy of star Brie Larson’s talent and passion. Rated • PG-13 for sequences of sci-fi violence and action, and brief suggestive language.